Six years deep. Thank you to everyone who checks the sites, hits me up with comments, feedback, and requests, and a special thank you to everyone that has hooked me up with music or filled one of my requests. I'm not sure what type of release this video ever received, I've never seen an original copy of it, only the VHS dub I received in a trade back in the day. Tags of The Times 3 has always been my favorite album in the series so I was happy to see them put out a sort of video documentary about the album. 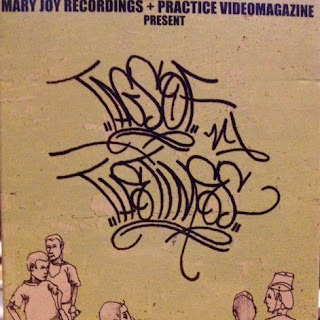 The video contains interviews and live footage featuring Murs, Scarub, Living Legends, Self Jupiter, Sach, Spoon (of Iodine), Company Flow, Mr. Lif & 3MG, Aceyalone, Fat Jon & Mr. Dibbs, Dreamweavers (L'Roneous & Elusive), Aesop Rock, Buck 65, Shing02, DJ Ice Water, Kirby Dominant, P.E.A.C.E., Atmoshpere, Mikah Nine, Megabusive, OD, and Emuse. This video was released by the good folks at Mary Joy Recordings and Practice Video Magazine. I've never been able to find any of the Practice Video Magazine issues so if anyone had a hookup that would be much appreciated. Tags Of The Times 3 Documentary from Jibs on Vimeo. Jibs, Thank you for all the goodies. Especially all of your VHSrips. Eternal Respect!!! Dope! I got this one plus issue 2 and 3 but no vhs player for a long time.. it wasn't that crazy in my memory anyway.